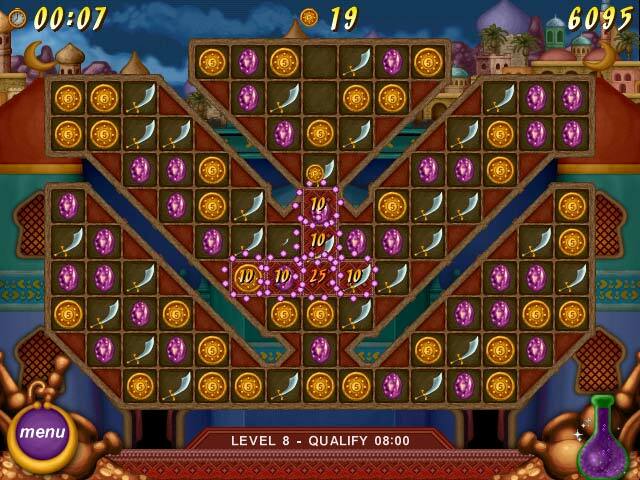 Go on an exotic trip throughout the land of Aladdin in this adventurous icon matching game. 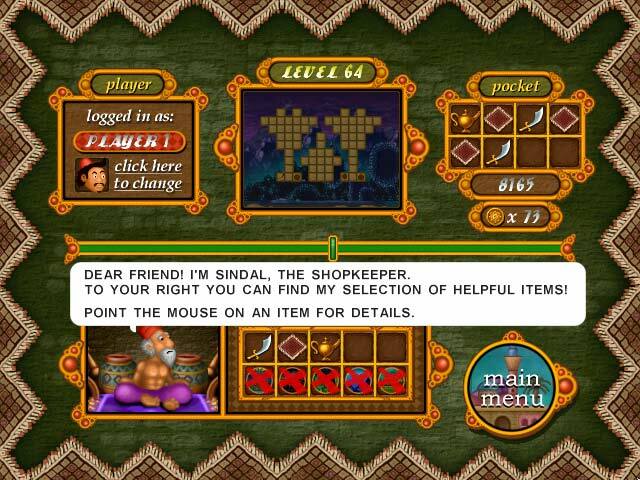 Pick your favorite character and recover the 120 missing pieces of the magic carpet, collect potions and trade valueful items with the shopkeeper in town. Make the legend come true and find yourself flying towards the lands beyond your deepest imagination. This is a nicely themed match 3 game. As you make matches, the tile backgrounds turn from a solid color to a carpet pattern, like a flying carpet. Cool idea. Matching also fills a potion jar which allows you to slide a row of your choice horizontally the equivalent of a tile or two to help you out of a tricky spot when you just can't make a match. 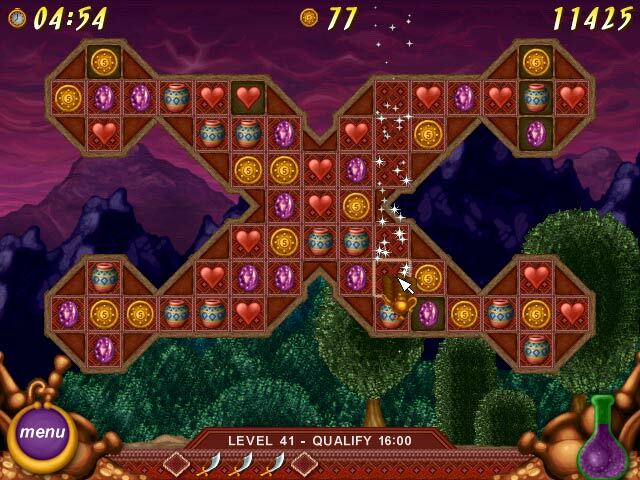 After each level, you are taken to a shopkeeper, where you can buy upgrades, including matching levels. You can also buy pieces of carpet for places where it is difficult to make matches, but I didn't see any way to apply these during a matching level. And unfortunately, the instructions are in abbreviated English and don't explain all aspects of the game. If you click on the Help menu, you have the option of going to a web page which has well written information, but it still didn't answer the questions I had about how to play some aspects of the game. The online help, but not the game, will tell you that you earn gold coins when you make matches that are both horizontal and vertical. Fortunately, you get the coins even when the matches are made accidentally by falling icons, because you need the coins for the upgrades. No complaints about the graphics or animations; they are much nicer than what you see in the screenshots. An entertaining game with an entertaining theme. It lost a star because of the missing instructions. Not everyone wants to tinker with a game to figure it out.